Munna Michael opened on an ordinary note over the Friday gone by [6.65 crore] and this is how the numbers stayed right through the week as well. There was no momentum that the film gained and with critical acclaim not being there and word of mouth not being positive either, the writing was clear on the wall. Eventually, the first week numbers of the film could just about extend to 31.62 crores* and yet again Bollywood’s wait for a success continues. It has been ages since one saw a commercially successful film in theaters and Munna Michael has added on to the list of films that could not cover the kind of distance that seemed feasible when they arrived. The film would now struggle to cross the 40 crore milestone and that would keep it lower than A flying Jatt lifetime [40 crores]. This is disheartening since the Sabbir Khan directed film is much bigger in terms of scale, setting, release, and investment. At the bare minimum, it should have crossed Heropanti lifetime [53 crores] but that was out of the question after the opening Friday itself. Sad, because Tiger Shroff has given a lot to the film. Meanwhile, Lipstick Under My Burkha has managed the first-week number of 10.96 crores. Given the fact that Konkona Sen Sharma and Ratna Pathak Shah are the only two known faces in the film, Ekta Kapoor has done very well to get respectable collections for this all-women affair. The film surprised after the first-day opening numbers of 1.22 crore and after that, the momentum just continued right through the weekend and then well into the weekdays as well.The film has followed a trajectory similar to that of The Ghazi Attack which had an opening day of 1.65 crores and then had first week collections of 11.85 crores. The Rana Daggubati starrer had a lifetime number of 20.50 crore and this is where Lipstick Under My Burkha should land up as well. 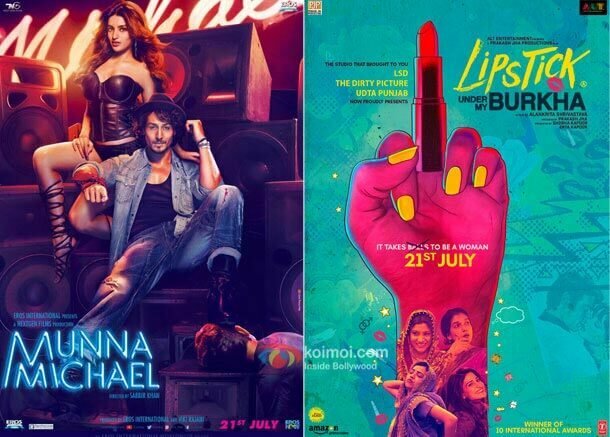 The post Munna Michael Has Ordinary Collections In 1st Week, Lipstick Under My Burkha Is Impressive appeared first on Koimoi.